Every once in a while we talk about fashion here on Take the Side Street, because I am secretly a total fashion expert and I like to share my knowledge with my friends. Really. Okay, you caught me. Every once in a while we talk about fashion because something catches my eye that I can't stop obsessing about and I need someone to say, "girl, I understand -- I love it too, let's both buy one!" Enter stage left, The Loafer Pump. This has been a fall/winter trend for the past several years, so I don't know why I'm just jumping on the bandwagon today, but here I am. Better late than never! If you already bought a ticket for this ride, make room for little old me. So cute. More my style than the oxford pumps I obsessed about in 2009 (oh yeah, that's where I've been for the last few years...) but still retaining a little of the menswear styling that we love so much this time of year. And then there's the one I sort of fell head over heels for... I do love a good wedge. I loooove the Bishops (A -- tassels! ), the Boutique 9s (C -- the green and the seam on the toe both make my head spin) and of course those wedges. OY. Does anybody else need a pair of loafer pumps (or wedges!) in their closet? Those are awesome!!! I just bought a pair of tall boots for fall, and I also hear that desert boots are back in action. Fashion is fun!!! man, i'm a sucker for a wedge heel. love it. 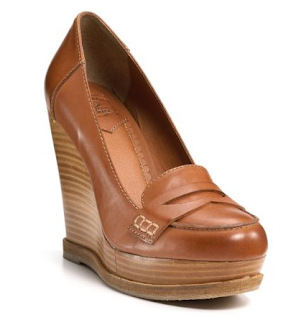 i just stumbled across this post while searching google for images of hte lucky brand june wedge. i just scored these on 6pm last night for $29.99! also, i had to laugh when i saw the boutique 9 night loafers, as i picked those up a couple months ago! i just jumped on the loafer/oxford trend a couple months ago myself (the B9's were my first). i've also purchased the nicole avid wedge in black & grey. super comfy!